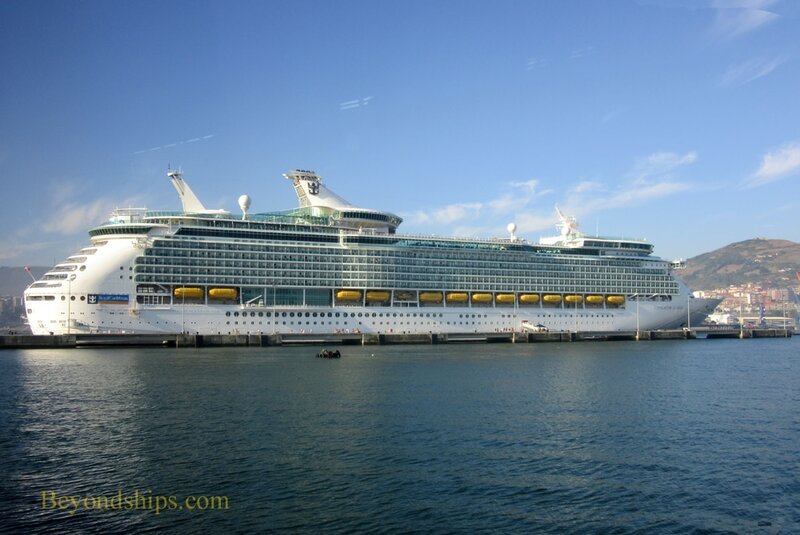 Navigator of the Seas docked at the Bilboa cruise port. The cruise port for Bilboa is not in Bilboa itself but rather in the suburban town of Getxo. It is about a 20 minute drive into the center of Bilboa. 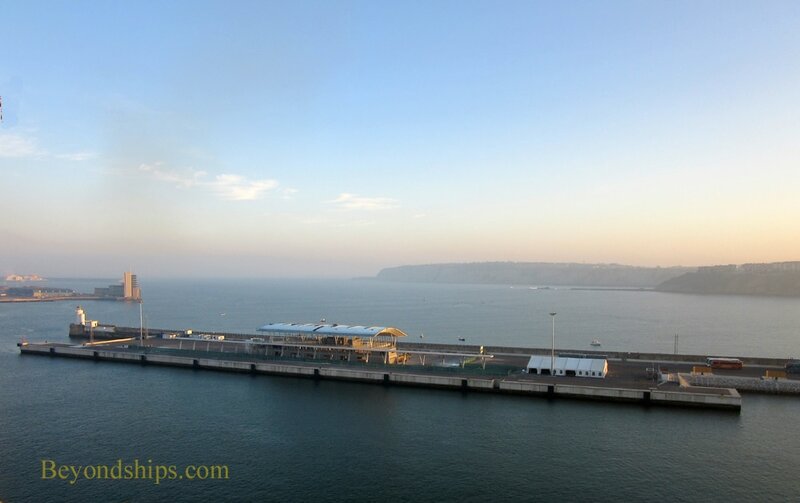 At the cruise port, there are two long piers, protected by a sea wall. There are terminal buildings serving both piers. A causeway connects the port to the mainland. Adjacent to the cruise port is an aquarium and a marina. Nearby, there is Erega Beach, a popular beach. Turn of the century mansions give the town architectural interest. 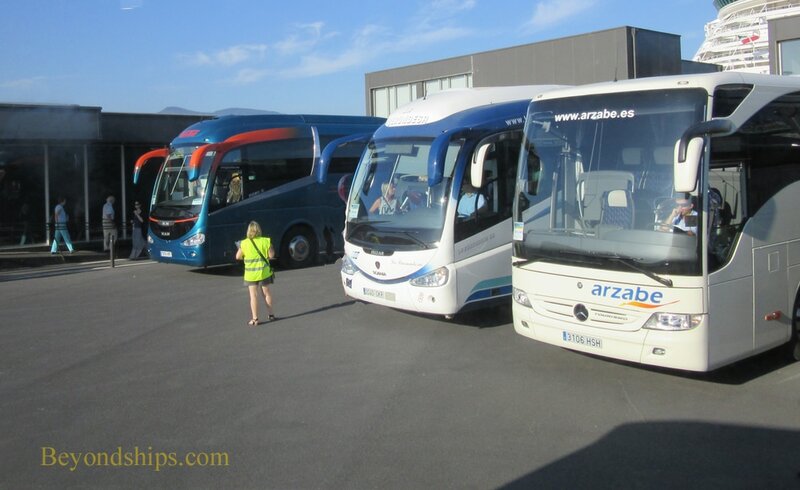 The cruise lines often make shuttle buses available to take passengers into Bilboa. In addition, the cruise port has a shuttle that takes passengers into Getxo. Another alternative is to walk to the Neguri metro station and take the subway into the city center. The walk is about 20 minutes and the ride is another 20 minutes. Public buses also run from the town into Bilboa center. The Bizkaibus Bus lines 3411 and 3413 take about 30 minutes to get into the city, depending upon traffic. Often, there are also taxis by the cruise port. ​The peak season for cruise ship calls in Bilboa extends from May through October. Above: Getxo 3 contains the newer of the port's cruise terminal buildings. Below: Shore excursion coaches outside of the cruise terminal that serves Getxo 1 and 2.